It’s tough times for the oldest fruit trees on the property, exacerbated by neighbours’ demands, old age and possum damage. The two trees at the centre of these separate dramas have probably clocked up several hundred years between them; they date back to the pioneering years of early settlement on the Adelaide Plains, when what is now the suburb of Magill was first established with vineyards and orchards to feed the white settlers. These remnant trees – an almond and a Satsuma plum – have somehow managed to survive urbanisation and the decimation of the old gardens in the district as the developers moved in and razed everything on these large historical blocks to build townhouses and units. That these two trees survived, where their sisters did not, owes everything to the fact that this land was largely vacant until this house was built on the remnants of the Penfold orchards in the early 1950’s, then passed from the original old couple who built it to myself – another gardener. The plum tree has rotted out with age, but hasn’t been helped by the invasion by brush-tailed possums that have systematically eaten off each year’s shoots during winter, distorting the tree’s growth. 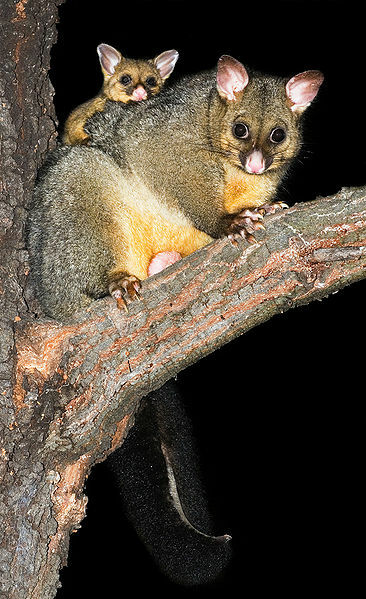 These possums have reached pest proportions in Adelaide gardens of recent times, aided and abetted by the installation of cable television and power lines that provide an aerial network of pathways that allows them to move easily above ground level (away from dogs) and to nest in safety in our roofs and dense trees. Modern fence lines also provide easy passage to fruit trees and vegetables in backyard gardens. Being Australian native animals, they are protected by conservation laws; it is illegal to trap them and move them, let alone kill them as the aboriginal population once did to provide winter furs. My only solution has been to block their passage onto this property by placing spiked sections of slit PVC tubes onto power cables to keep them off our roof, offering some relief from their early morning snarling and hissing and giving the fruit trees a chance to come into full leaf during Springtime. The almond tree was causing a different problem entirely, although it also suffered extensive possum damage and kept our neighbours awake with their nocturnal territorial squabbles. This almond tree is entirely on my property, but the neighbours – like many others in Adelaide – wished to install solar photovoltaic panels on their roofs to offset rising power costs, helped by Government rebates. So this tree needed to be lopped to allow them solar access. In both cases however, I’ve been able to extend the lifetime of these historic trees by encouraging sucker growth (in the almond) and grafting winter budding material from higher up the old (plum) tree to the trunk lower down. These younger shoots will build new trees upon the root systems of the old, and I’ll be able to keep those early varieties alive for another generation. All this effort is easily accomplished using an electric chainsaw – a far more reliable tool in an urban garden than my old petrol-powered chainsaw, which required endless effort to keep it serviced and running. Seven dollars is all that is required before each major job; this buys me a new chainsaw file with which to sharpen the teeth.